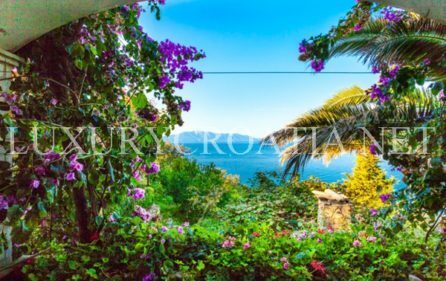 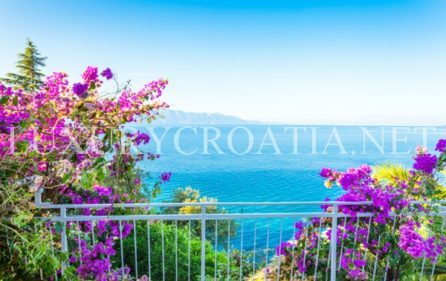 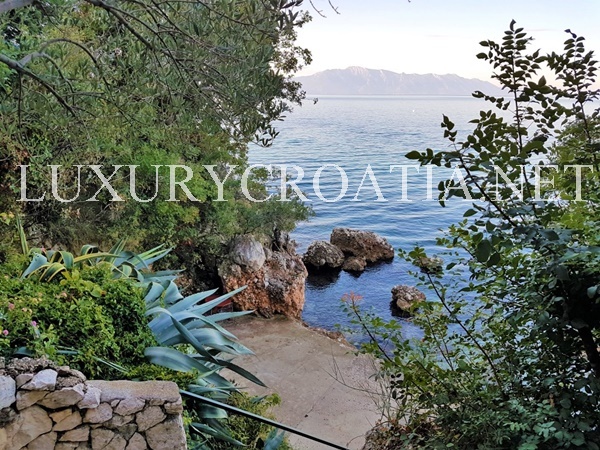 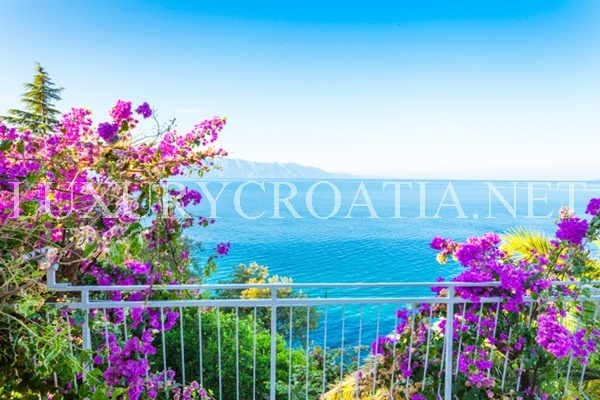 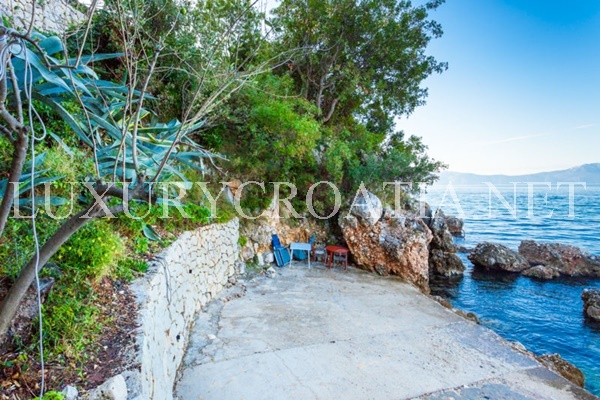 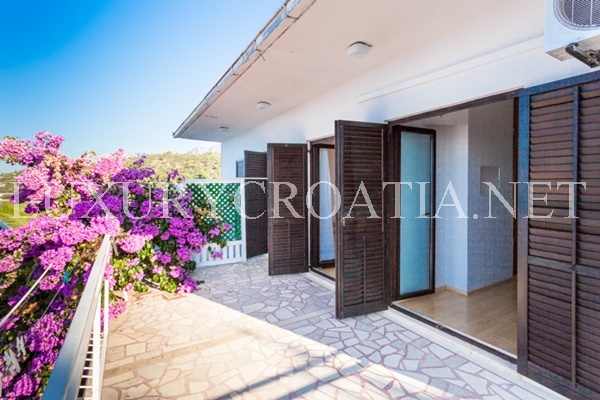 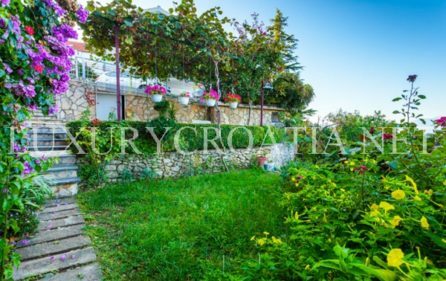 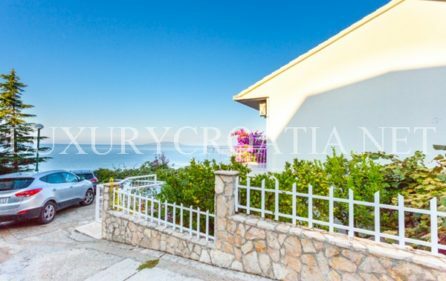 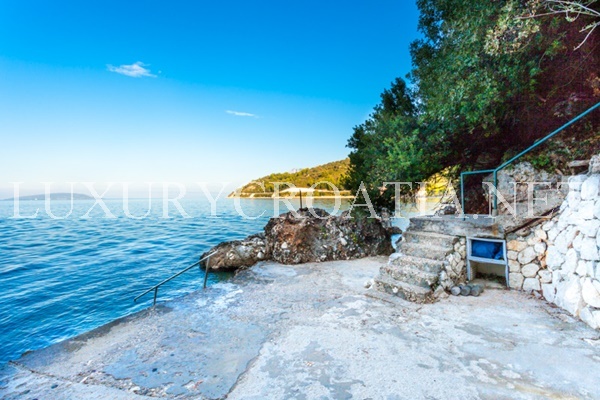 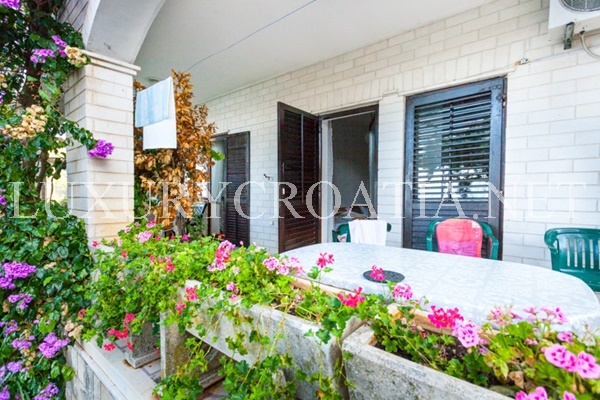 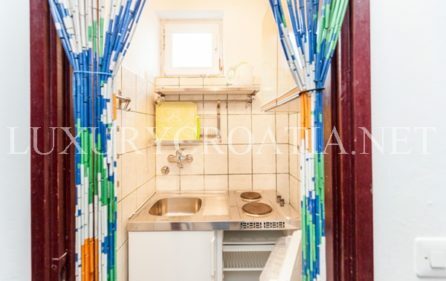 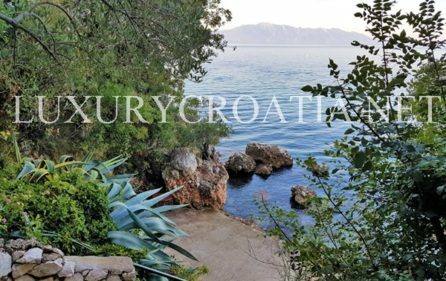 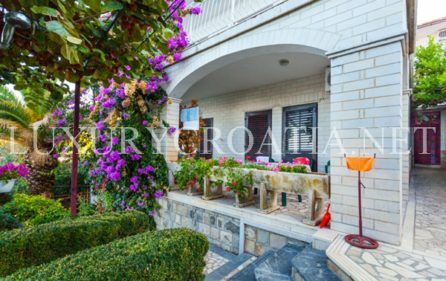 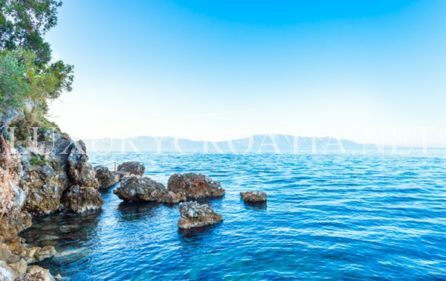 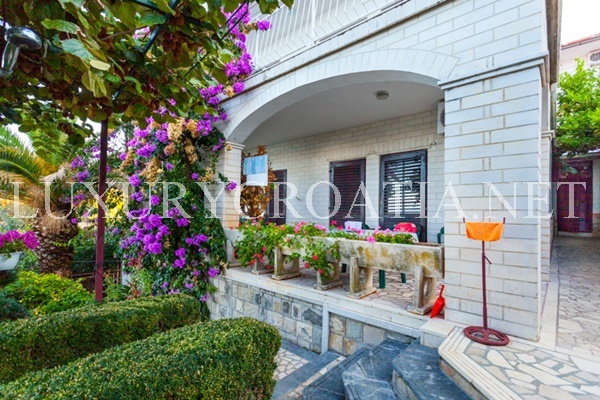 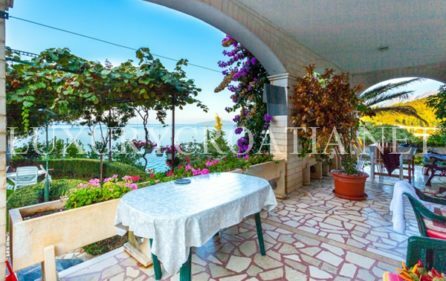 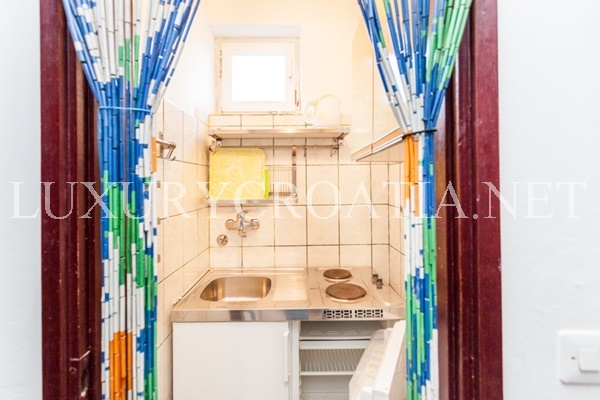 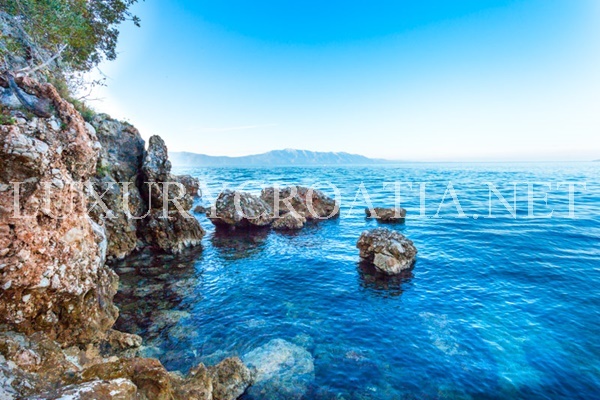 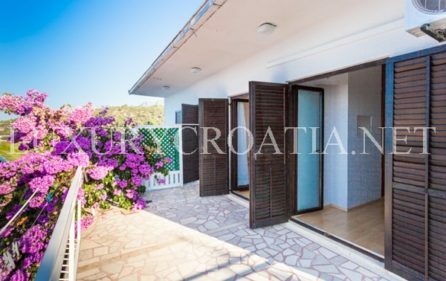 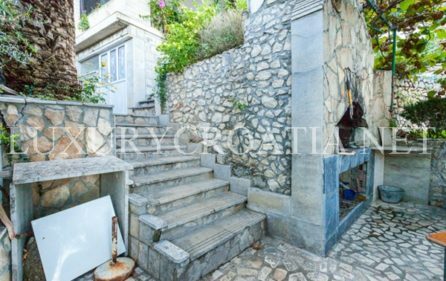 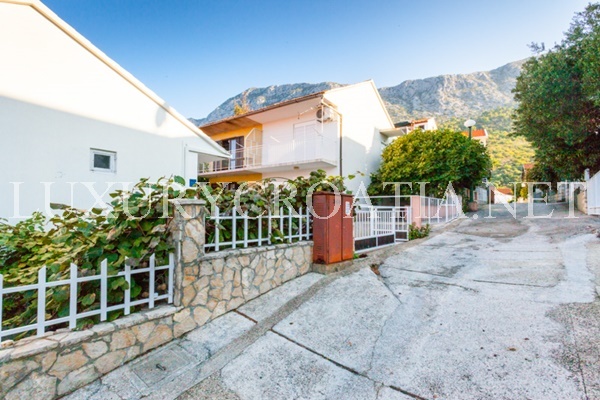 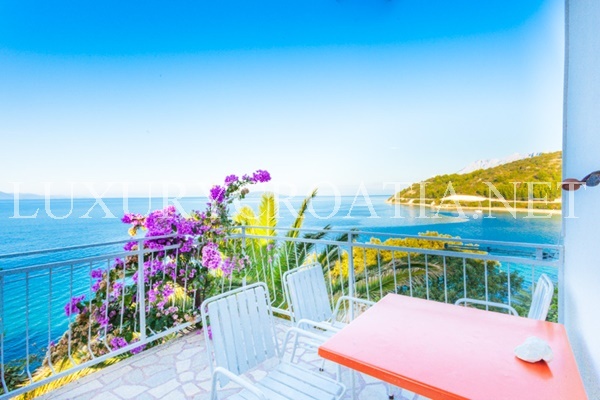 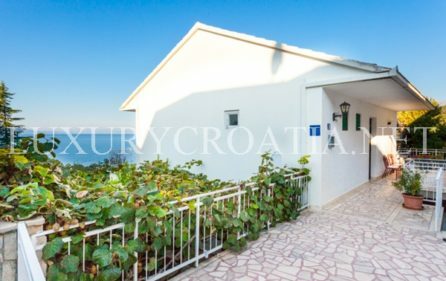 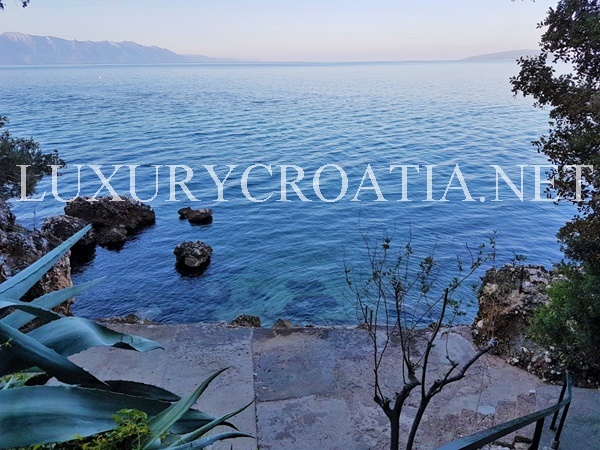 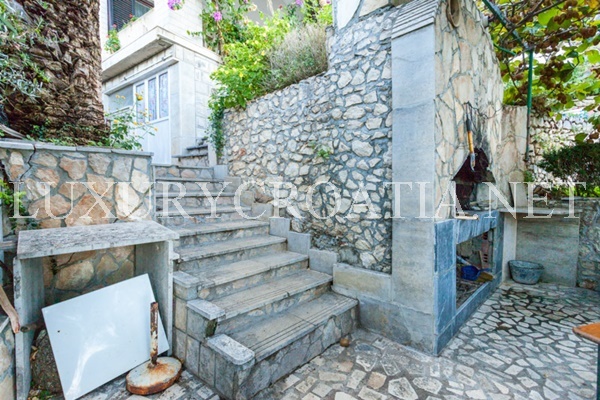 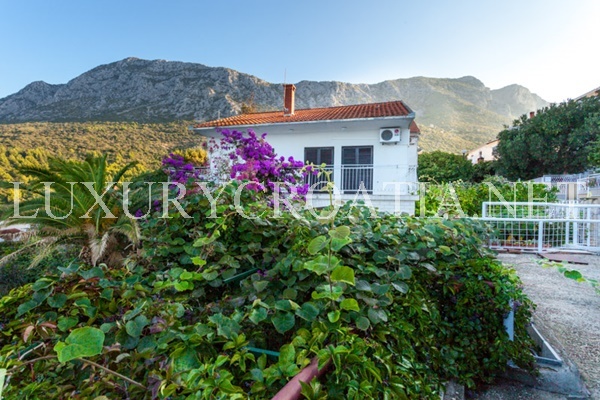 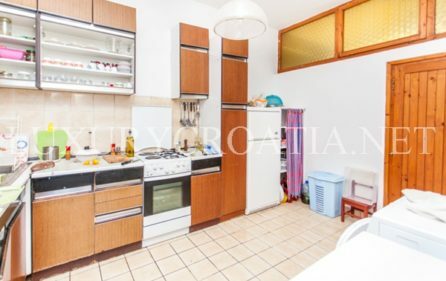 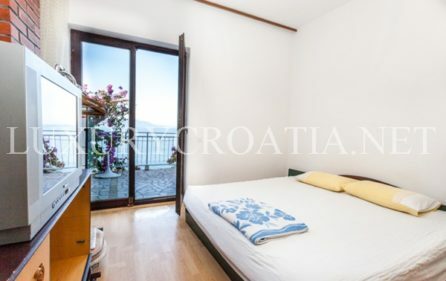 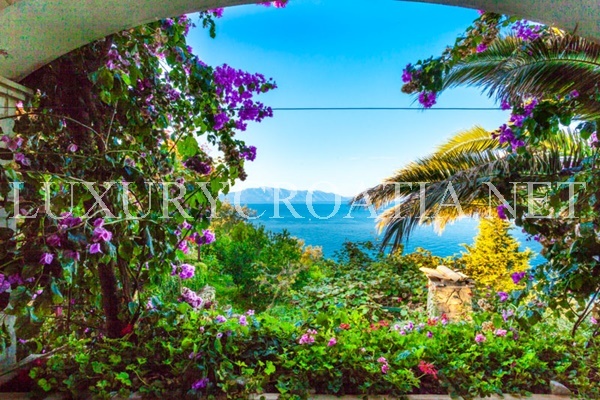 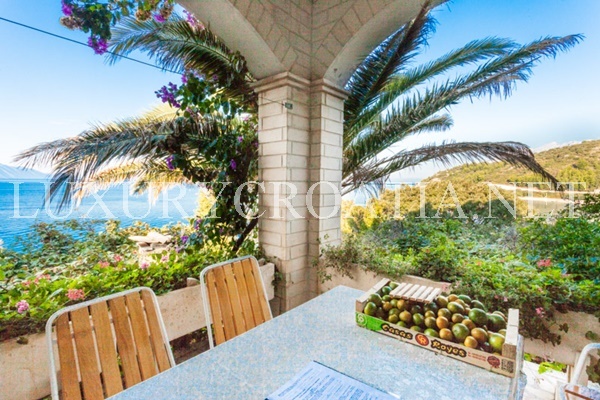 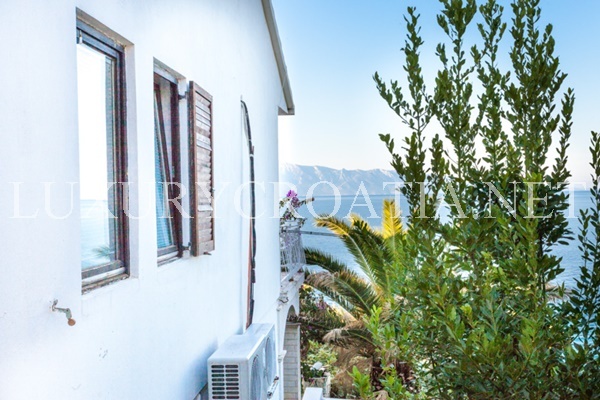 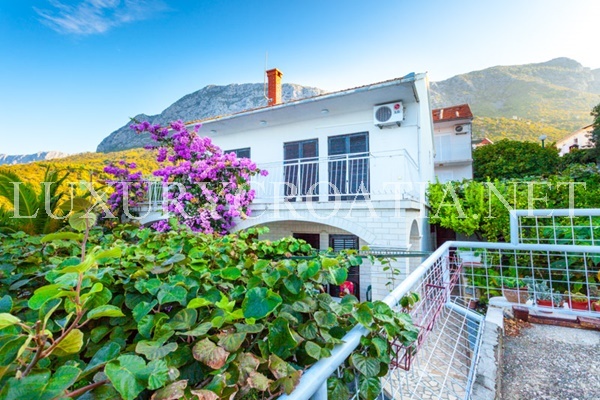 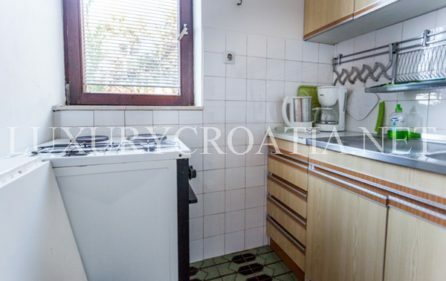 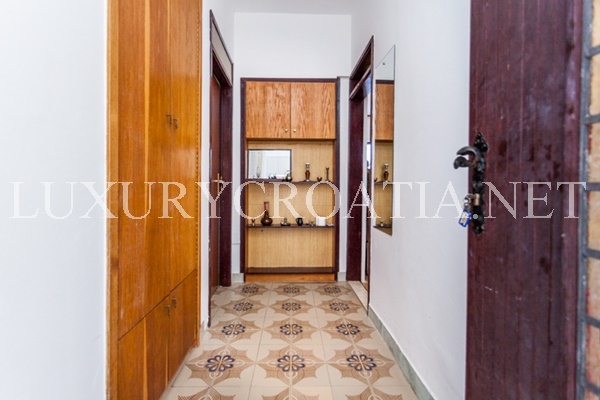 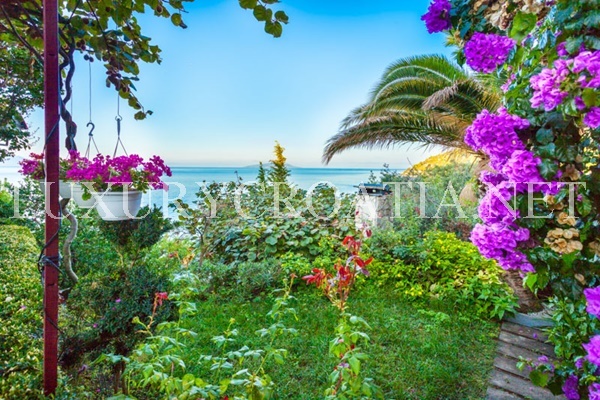 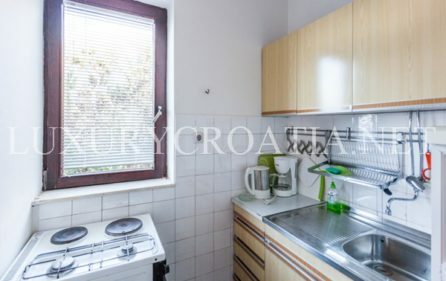 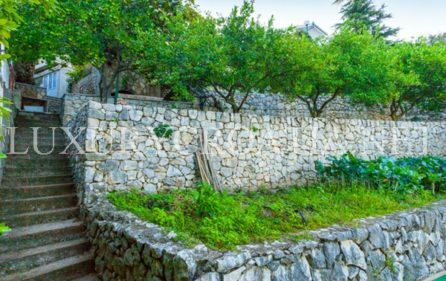 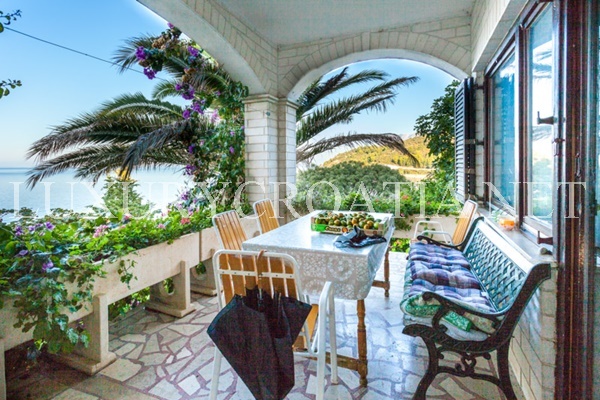 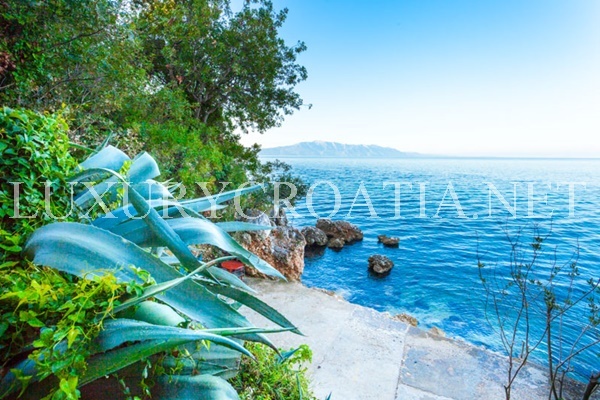 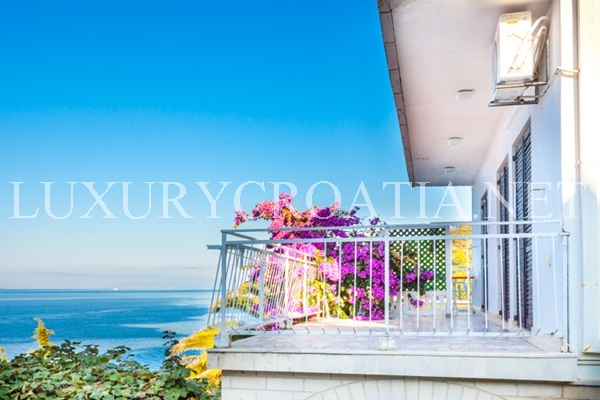 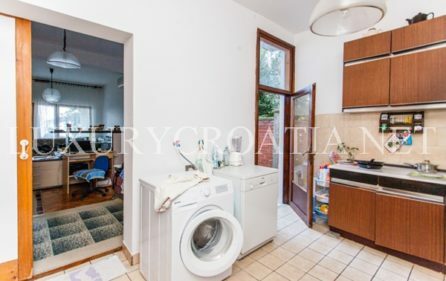 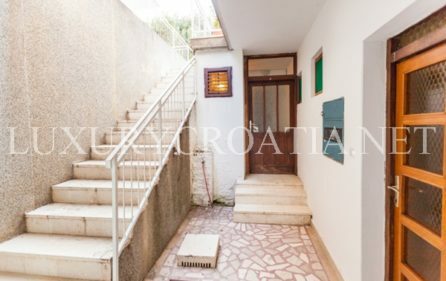 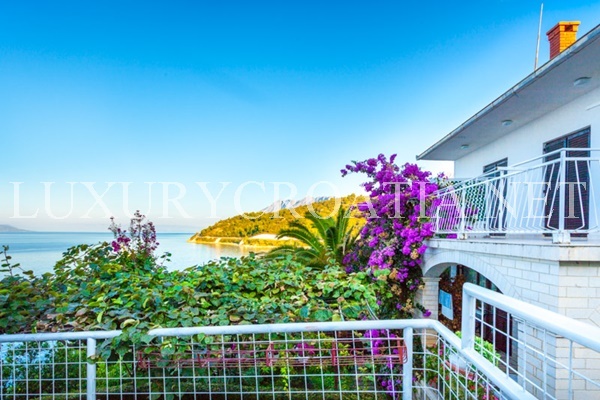 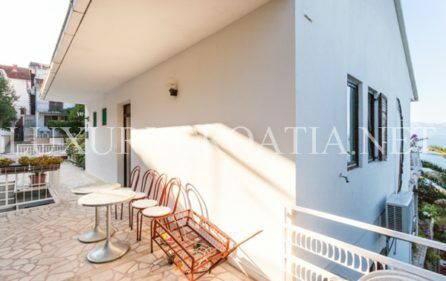 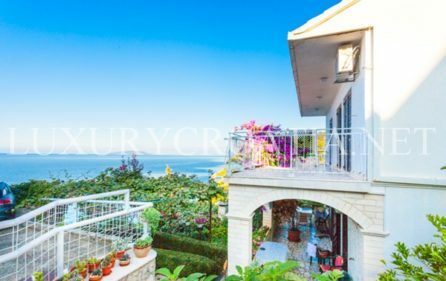 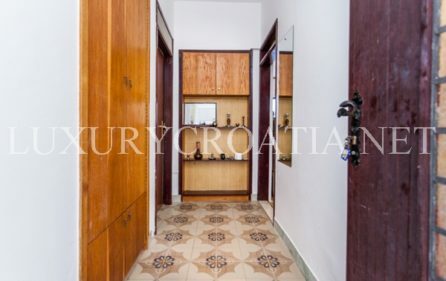 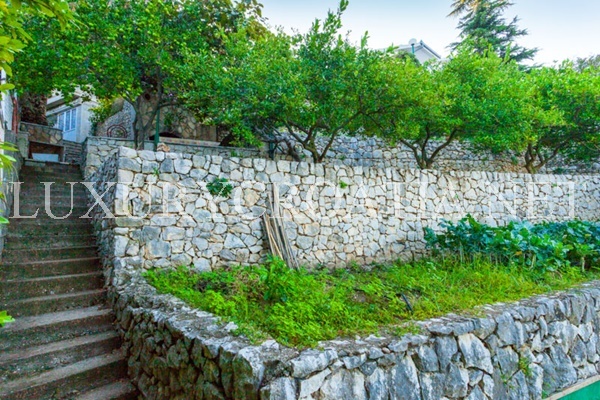 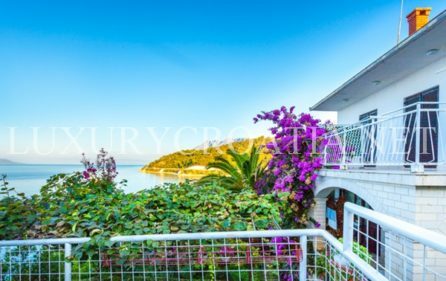 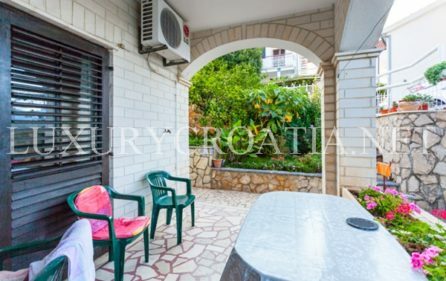 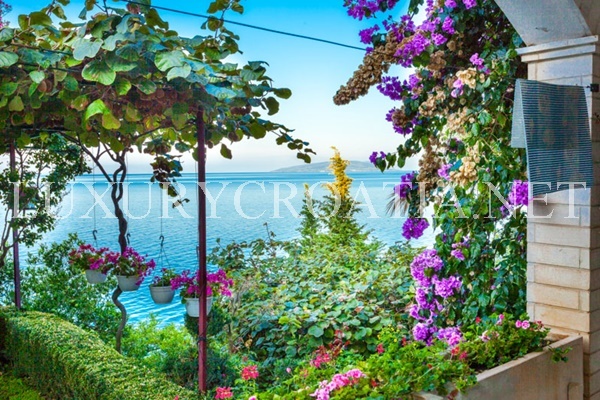 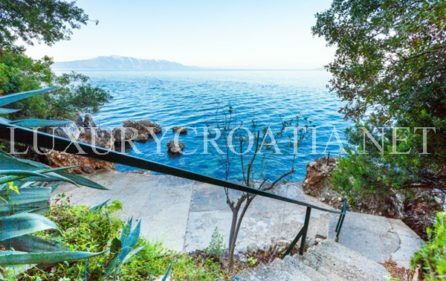 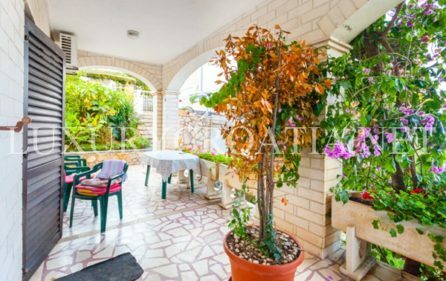 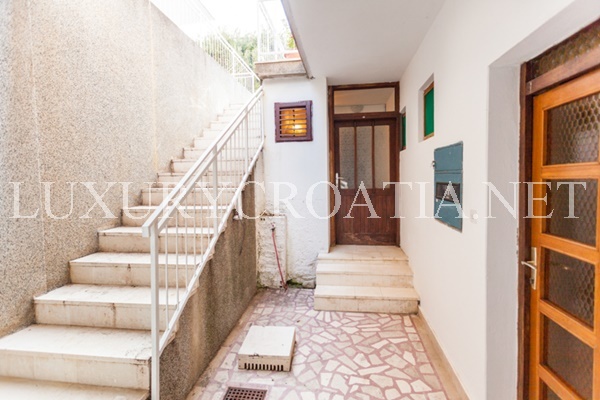 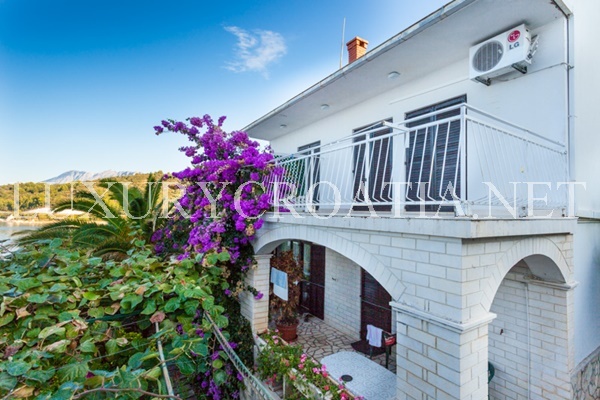 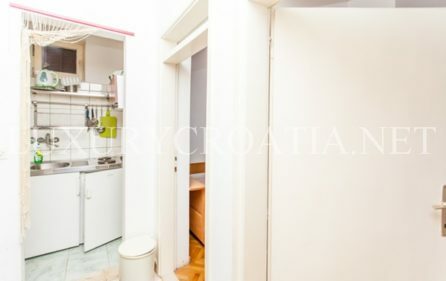 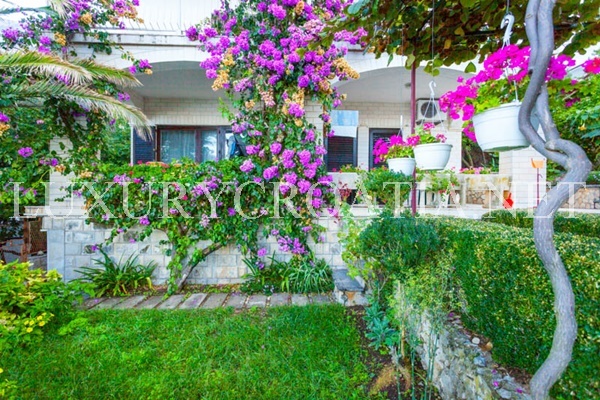 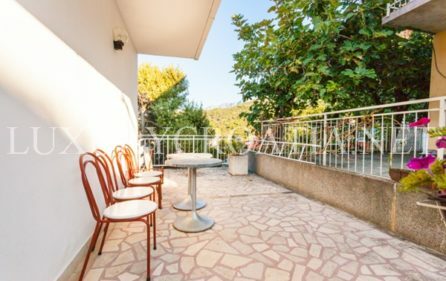 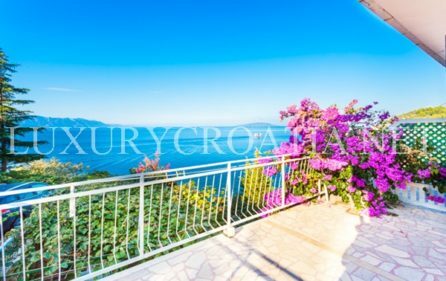 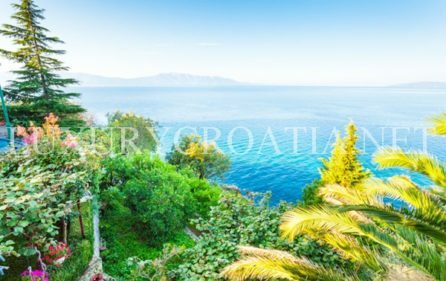 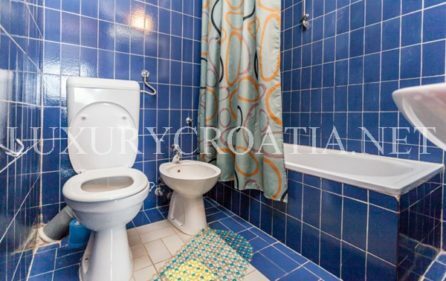 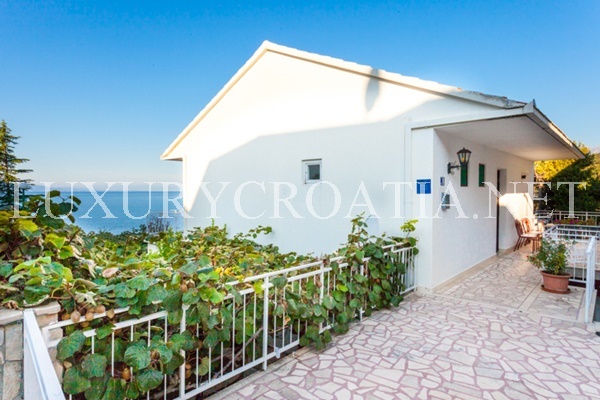 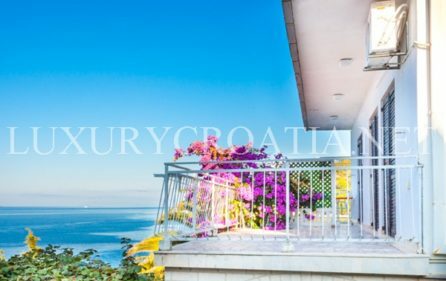 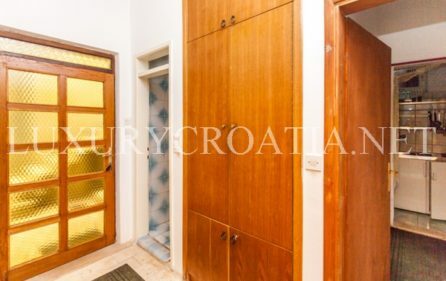 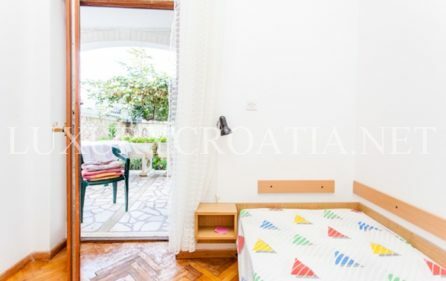 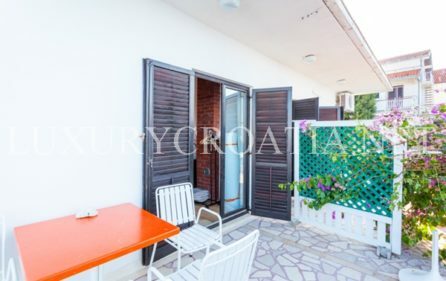 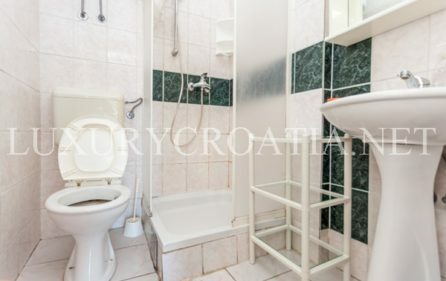 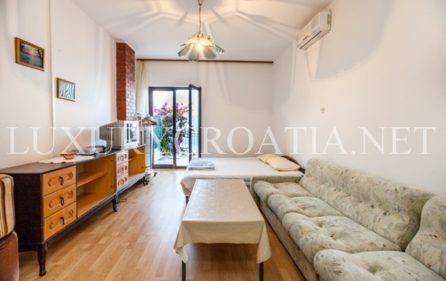 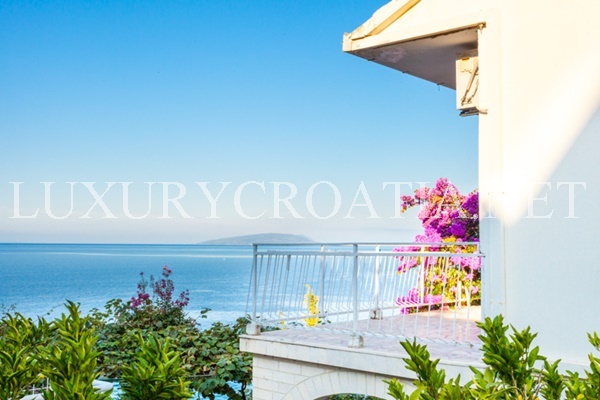 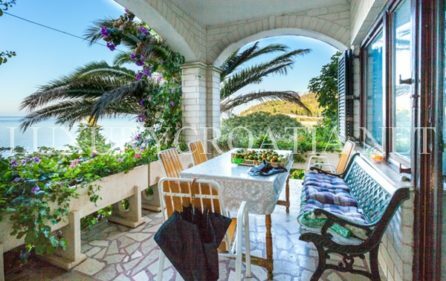 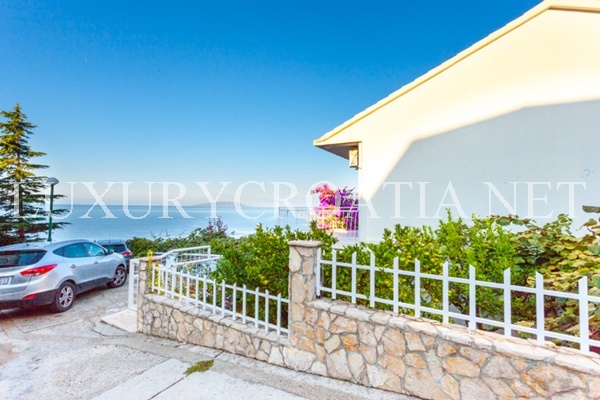 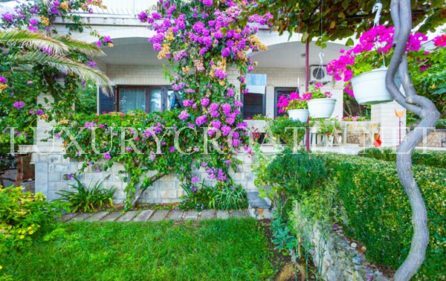 Waterfront house for sale Makarska Riviera, this is a unique location on the seafront, with private access to the sea and completely private area on the sea that is not possible to access by any other way but only through the garden of this house. So the owner of this house enjoys total privacy and exclusive use of this seafront stone plateau where is possible to moor a boat as well. 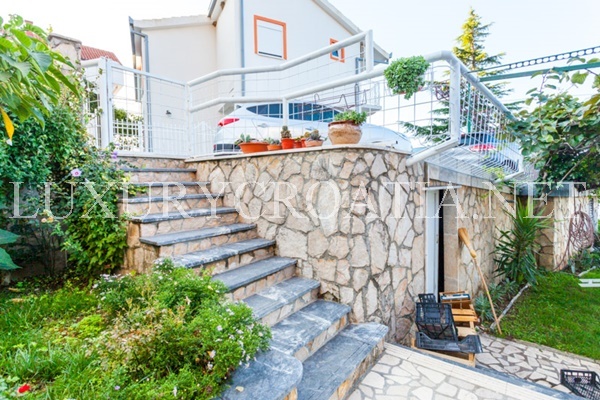 House has car access by asphalted road and 3 parking places next to the house, with an additional two parking places inside the fence on the side terrace. 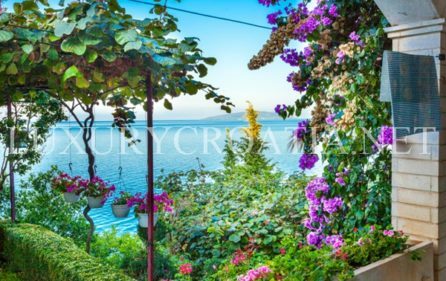 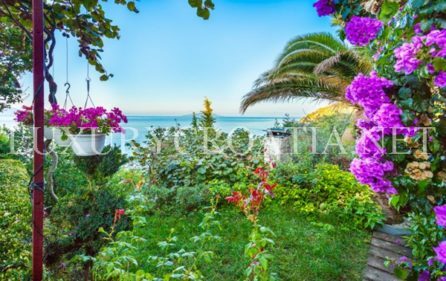 There is a large lush garden with a lot of Mediterranean trees, large palm trees, olive trees, flowers like bougainvillea, aloe vera, lavender and rosemary; fruits like lemons, oranges, tangerines, kiwi. 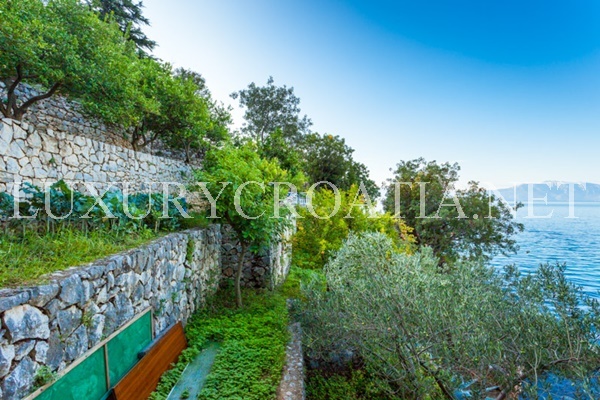 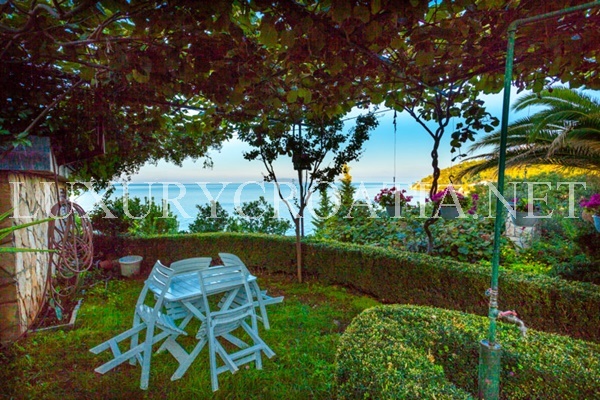 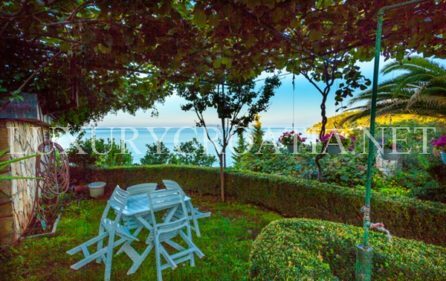 Garden is cultivated and stretches in front of the house and in cascading stone walls towards the sea. 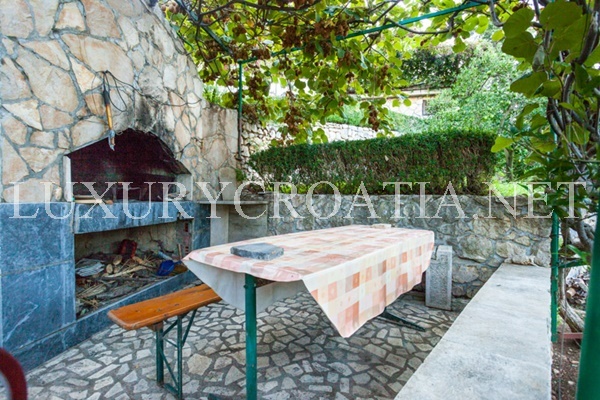 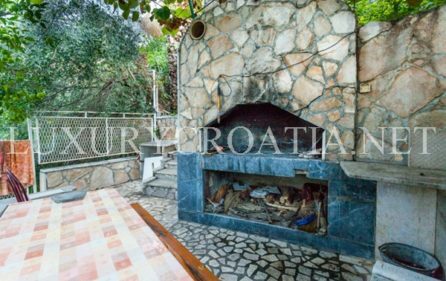 There is a large outdoor fireplace for barbecue, placed on one of the cascading terraces towards the sea. 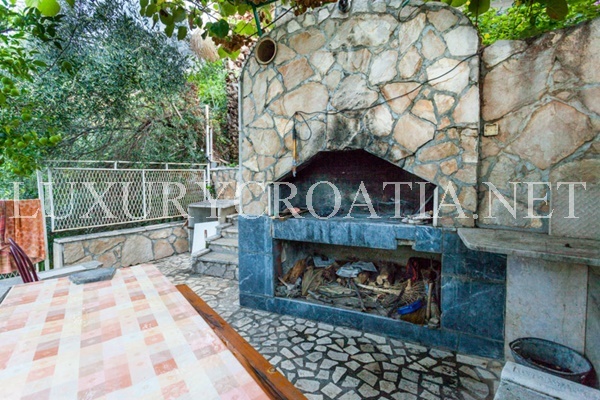 There is enough space for a table with chairs in front of the fireplace. This waterfront house has a private beach which is made of concrete and covered in stone tiles. 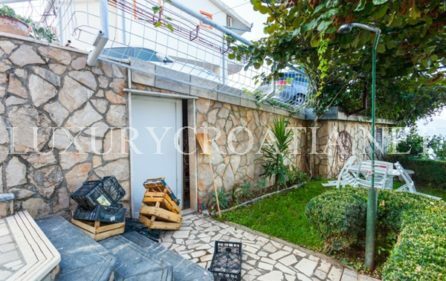 House structure is solid and needs no repairs. 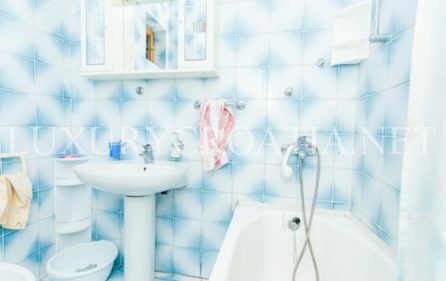 But interior works on new bathrooms, kitchens and new furniture are needed. 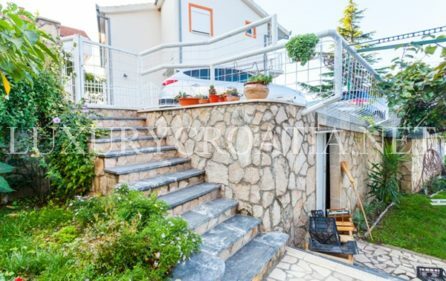 House has 2 levels. 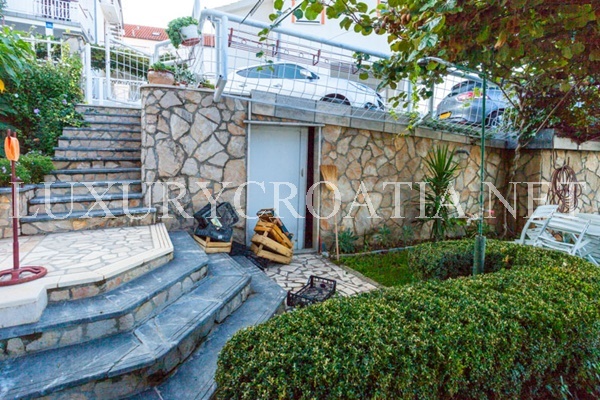 Each level has 100 m2. On the ground floor is a main two bedroom apartment with open plan kitchen and dining with living area, with bathroom and additional toilet. 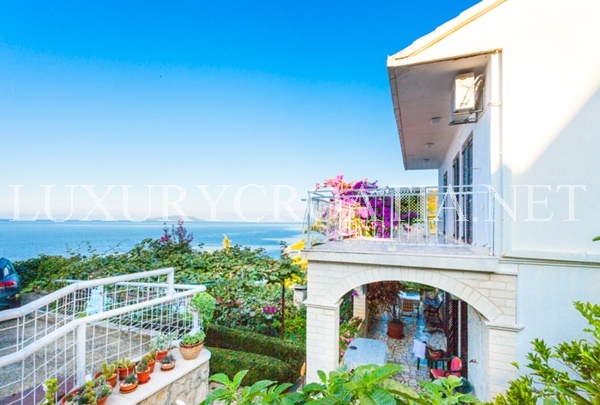 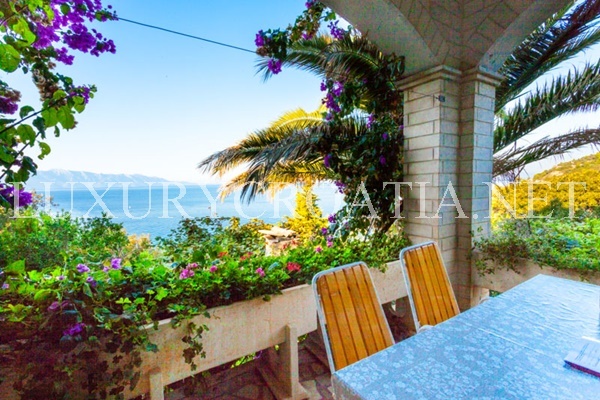 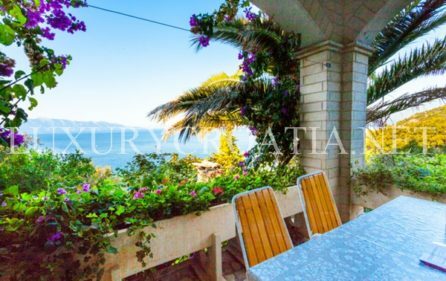 In front is a beautiful covered terrace with sea view over the green lush garden. 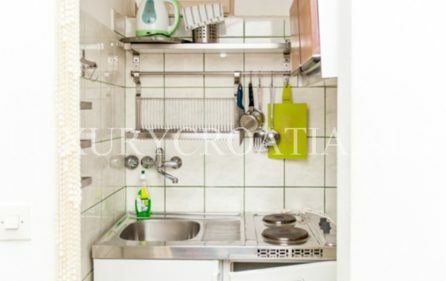 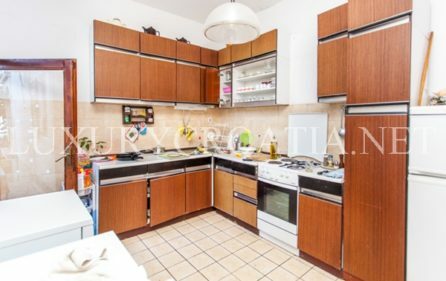 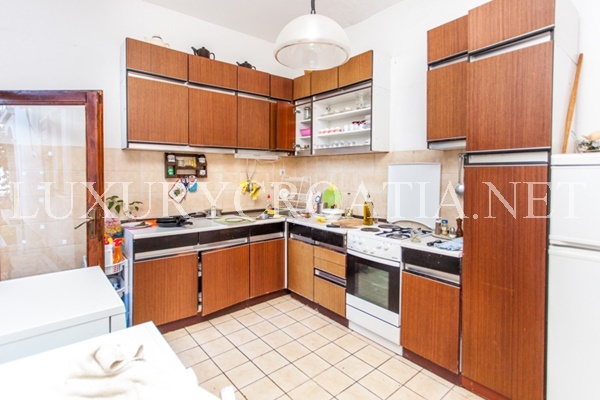 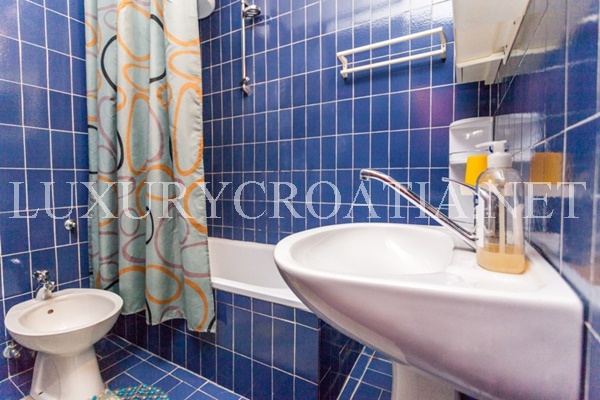 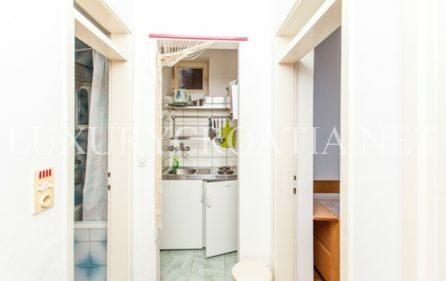 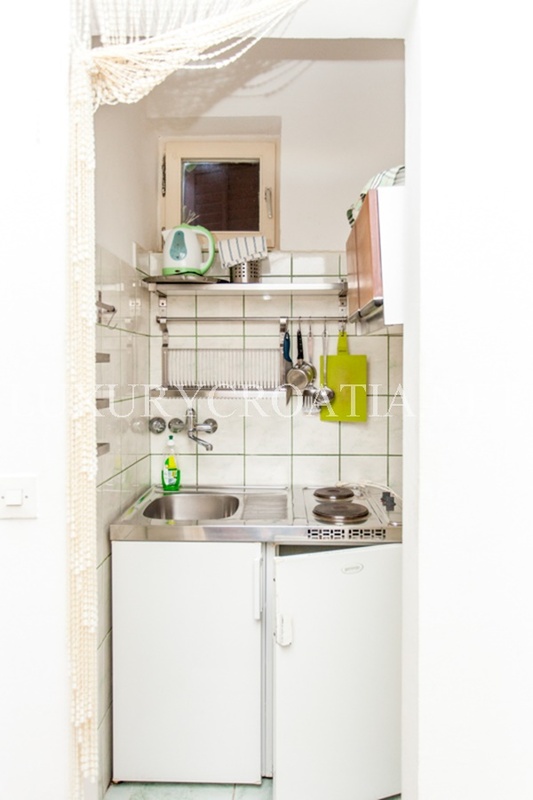 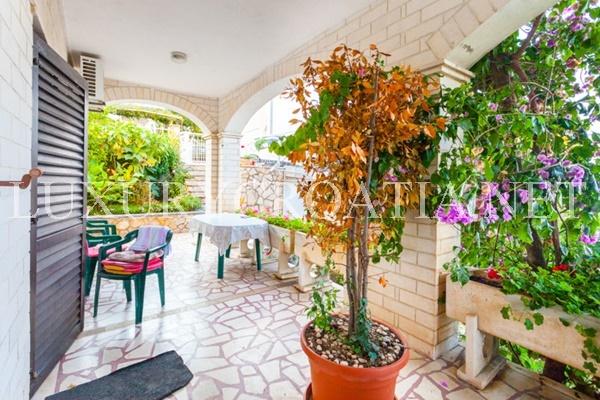 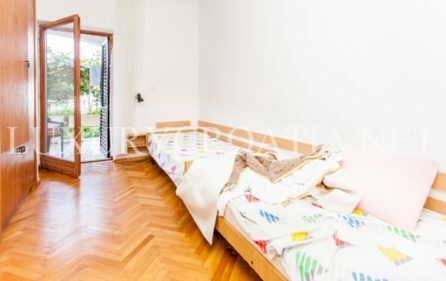 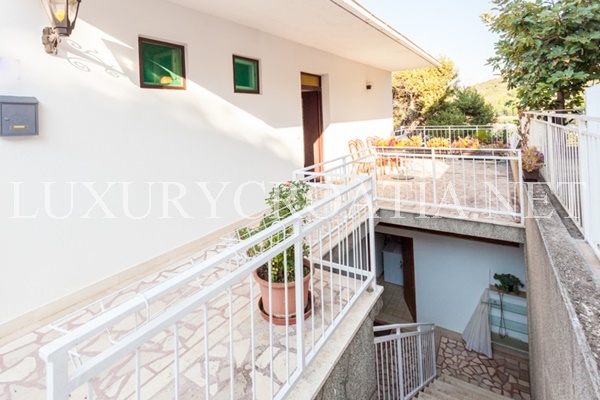 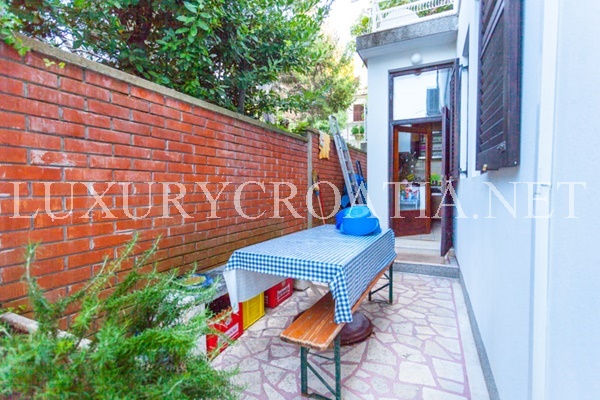 Aside is small studio apartment (with kitchenette and bathroom) with terrace and exit to the main terrace and garden. 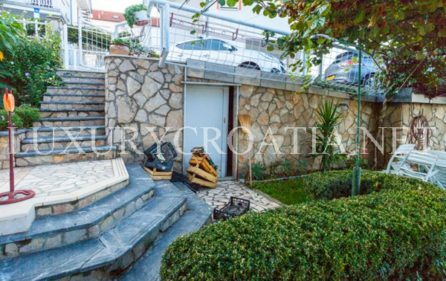 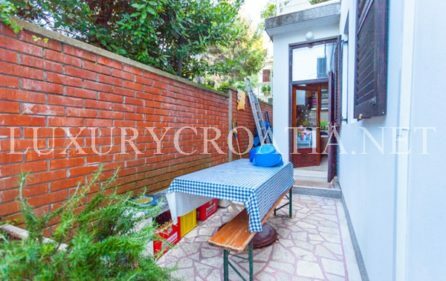 In the garden, there is an additional storage house that is about 50 m2, on top of that storage area is parking for 3 cars. 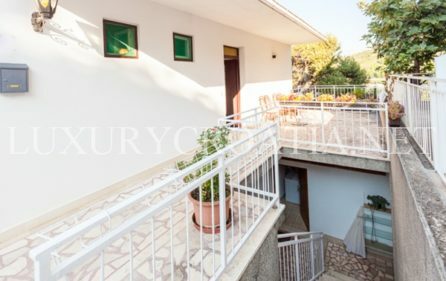 On the first floor, there are 2 apartments. 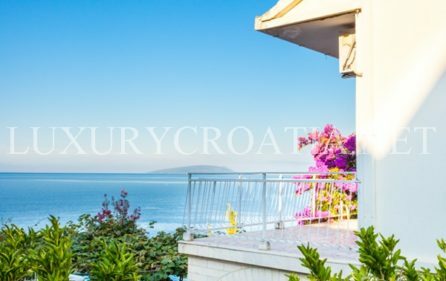 The larger one has two bedrooms, with a kitchen and living area, bathroom, and a large terrace with spectacular sea view. 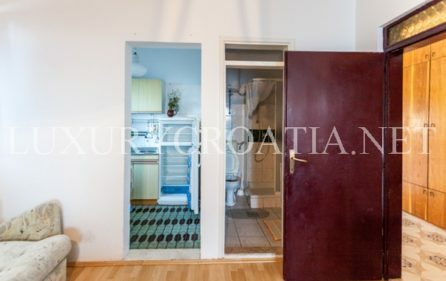 House is oriented to the south and west. 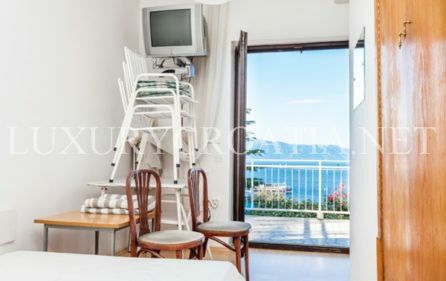 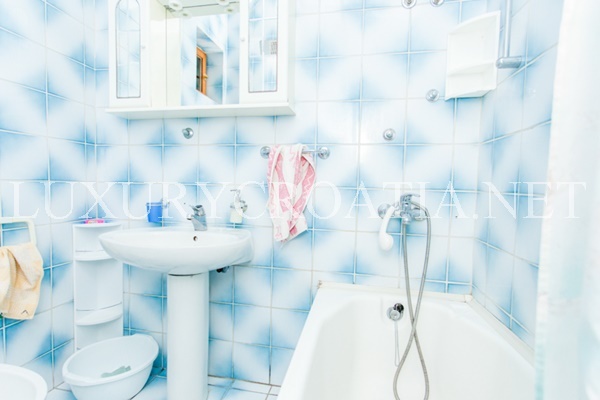 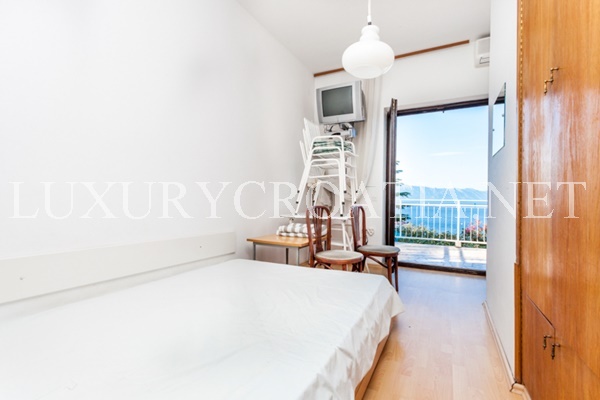 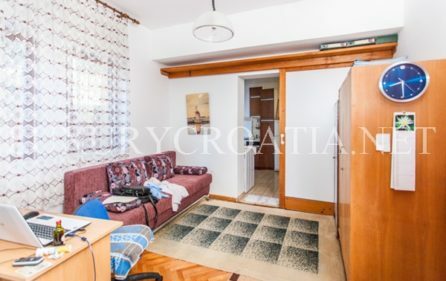 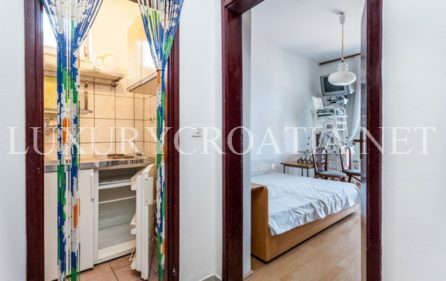 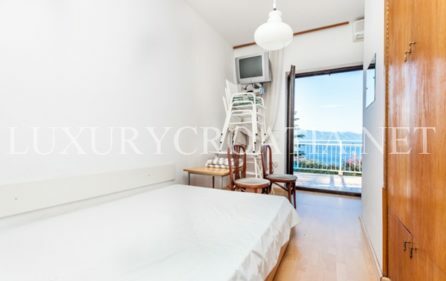 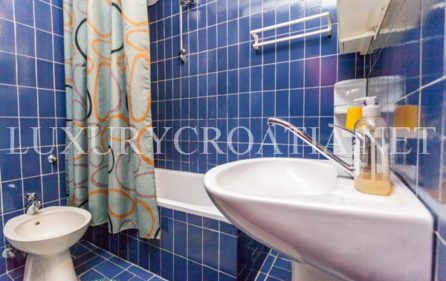 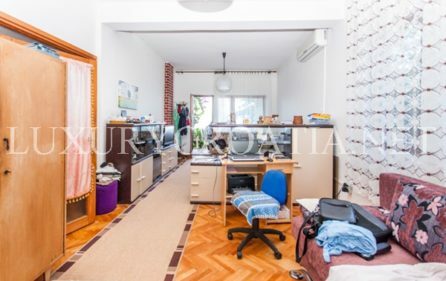 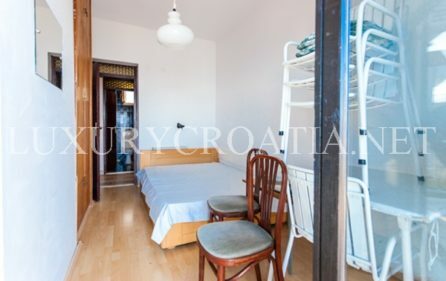 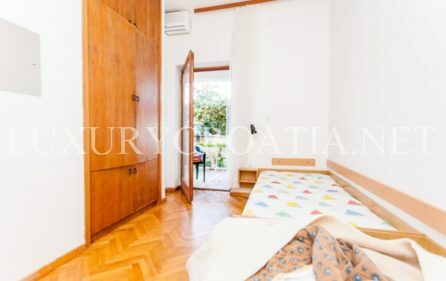 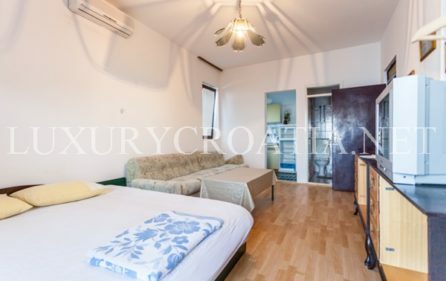 Another apartment is on this floor and it is a large studio apartment with kitchenette and bathroom and also a large terrace with an amazing sea view of south and west. 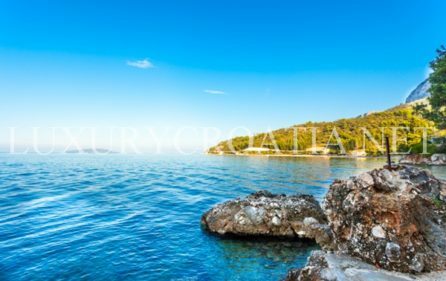 More about buying procedure please read in our article.